If you don't already know by now, I absolutely love the adventures and places my job takes me. This day was a perfect example of this. Stewart contacted me to catpure his proposal to his girlfriend, Angela, while they were on his graduate school celebration trip. 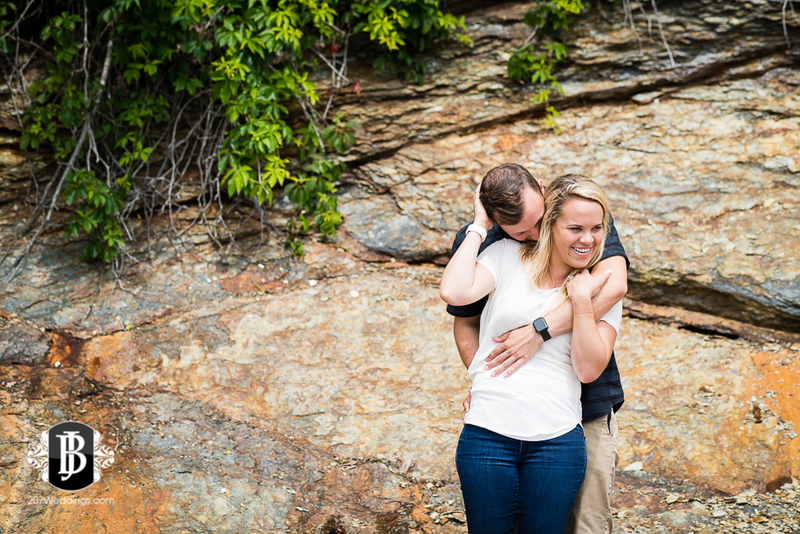 We originally planned on going to Back Cove for the big moment, but then Stewart came across Mackworth Island and fell in love with what he saw online. And what an awesome choice it was! I sometimes feel like a tourist in my own city, and love to visit the amazing places all around the great state of Maine. So this was the perfect opportunity to explore the mysterious island I have had my eye on since moving here! Maine delivered far beyond anything I ever expected with this trip (as is now the norm in this amazing state!). As you head North on 295 from Portland, you can see the long, lonely road stretching over the water from the main land to the island with water on either side of it, making it almost like an isolated island itself. And this day, the fog was thick and heavy, making the allure and mystery that much stronger for this curious soul. It's definitely like something you would see in a movie. As I came to the entrance of the lonely road, I was overjoyed to finally make the drive ahead into the unknown. I found one of the last spots in the little parking lot at the trail head, and as I gathered my gear for the shoot, the fog continued to thicken even more. I started out on the trail, and was greeted by several joggers, hikers, dog owners enjoying the beautiful scenery of the island, even (and probably especially) with the conditions. The trail winds and curves along the coast of the island and is lined with lush, green Maine forest, dotted with ocean views every so often as there is a break in the trees on that side. It wouldn't be complete with some beach access, a swinging love seat overlooking the ocean, and a fairy village created by children. Enter random, old horse tie posts that once graced the entrance to the old school on the island, and the scene is complete. It is absolutely breathtaking. After about a 15 minute walk, I found myself at the meeting point - a large, stone ledge jutting out into Casco Bay. Two fishermen sat at the end, chatting and enjoying the moisture in the air. I made my way down the stairs of the ledge and got into place. The fog became thicker even still. I became concerned that the fog would be too prevalent in the shots, but then, all of a sudden, the fog gave way to some blue skies with a nice overcast light behind me. It was wonderful! And soon after some texting back and forth and coordinating, Stewart and Angela made their way onto the ledge from their "walk" on the island's path, and it was time. Stewart pulled the ring box from his pocket, got down on one knee and asked Angela to be his wife. She immediately came to him with a kiss of acceptance, and they embraced with glowing smiles. They were absolutely on cloud nine for the rest of our time together, and naturally fell into place with such ease and grace it just shows in these images. I loved my time on the island with Stewart and Angela, and also how these all turned out. And I hope you do as well!